Hold on to your hats, everybody. Mackey’s DNA results have just came in from Wisdom Panel… and they’re pretty surprising! Before we get into the results, let’s see what everyone guessed from the last post. Haha, nice one on the “taco” guess as he was wearing a taco costume for halloween in the main photo in the last post. I also love the Goober and Wienerschnitzel guesses! Dachshund and Terrier seem like safe guesses… so let’s see how we all did! So there you have it. A huge portion is mixed beyond recognition (they suggested the breed groups of Companion, Asian, Mountain Dogs, and Sporting) then equal parts Bichon Frise, Minaiture Pinscher, and Pekingese. 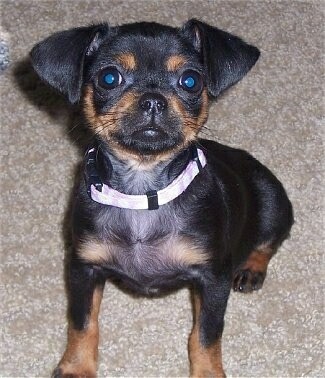 Miniature Pinscher we can sort of understand, maybe? His coat is pretty short like a MinPin, but his ears flop and he’s rather short. I guess the nose could be right? I’ll have to look at more photos. 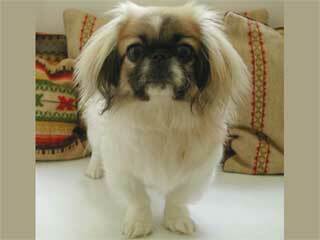 As for Pekingese, we can understand this for the coloration as well as the body shape. What a surprise to us that both Mackey and Splotchy have Pekingese, it seems that may be how they both got their black and brindle coloration. I searched online for a Miniature Pinscher and Pekingese mix, apparently they call that ridiculous “designer breed” of dog Peke-a-pins (again I say, who would do such a thing?). A few of the photos actually do look similar to how Mackey and his siblings looked as puppies… so this makes some sense. We always figured Mackey was part dachshund due to his shortness, his shape, how his feet point outwards (though now that I look at some Pekingese photos, they do that too it seems), and some of his mannerisms. So it’s very surprising to me that this didn’t show up in the family tree, even in one of the breed groups identified in the “mixed beyond recognition” portion. We’ve agreed that we will continue telling vets and such that his breed is Dachshund, as that best describes his looks. After all, if he were to go missing, no one would find him if they’re looking for a Bichon Frisé/Miniature Pinscher/Pekingese! There are a lot of mixes in there, and not many purebred ancestors especially when compared to Splotchy’s family tree. Are you just as surprised with Mackey’s results as we are? Let us know what you think in the comments. Last but not least, we will be DNA testing Miguel once Wisdom Panel 3.0 tests go on sale again. So follow our blog to stay tuned for that and more! That is, if Anthony can manage to stick the swabs in Miguel’s mouth for 5 seconds each.